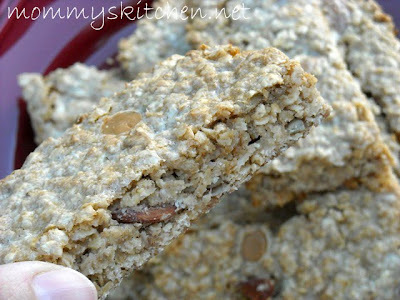 Mommy's Kitchen - Recipes From my Texas Kitchen: Homemade Granola Bars for National Granola Bar Day! Homemade Granola Bars for National Granola Bar Day! Today I am featuring one of our new favorite snacks, Homemade Granola Bar's. Did you know that Wednesday was National Granola Bar Day? Well you know me and the whole food holiday thing. I kind of get sucked into it from time to time. But what better excuse to bake up something yummy. I usually purchase granola bars at the store so this was my first attempt at making them from scratch. My husband bought a huge container of oatmeal at Sam's Club so I have plenty to use up. Lately I have been making all sorts of different recipes that include oatmeal just for the fact that we still have so much to use. I don't know why but for some reason my husband seems to think we need to stock up on a ton of food in case we get snowed in or trapped in the house LOL. I do know one thing I dont think that we will be getting snowed in anytime soon seeing that we live in Dallas. Oh well I guess if he wants to stock up on anything food would be the best idea. I do know one thing in our house it will definitely get eaten. OK back to the granola bars. When I was trying to decided on what granola bar recipe to use it didn't take me long. I remembered a recipe in Jane Doiron's cookbook ”Make Ahead Meals for Busy Moms”. I am seriously loving this cookbook everyone. It has so many easy and time saving recipes just like this granola bar recipe. My daughter is a big fan of the store bought granola bars so I was a bit excited to try these out on her. This recipe is so easy peasy and quite versatile. Which means that you can change up the ingredients to your liking. So have fun and experiment with different add ins. I chose to stick to the recipe for my first attempt, but I did omit the peanuts and added some butterscotch chips to the mix. I really loved these granola bars and the next day there wasn't any left, so that should tell you if we liked them or not. Lets start by preheating the oven to 325 degrees. Line a 15x10x1 in baking sheet with aluminum foil and spray with non stick baking spray. I used a 9 x 13 inch glass pan because I wanted my bars thicker. add the sweetened condensed milk and melted butter. Stir well to make sure everything is combined and mixed together. Pour into prepared pan and spread out the mixture. Press down to make it even. Bake for 25-30 minutes or until golden brown. Cool 5 minutes in the pan then cut into bars. Place the bars on a wire rack and cool completely. Store loosely covered at room temperature. Preheat oven to 325. Line a 15x10x1 in baking sheet with aluminum foil and spray with non stick baking spray. I used a 9x13 inch glass pan because I wanted thicker bars. Stir all the ingredients together in a large bowl. Pour into prepared pan and spread out the mixture. Press down to make it even. Bake for 25-30 minutes or until golden brown. Cool 5 minutes in the pan then cut into bars. Place the bars on a wire rack and cool completely. Store loosely covered at room temperature. Here is a list of all sorts of ingredients that you can add to your granola bars. Just mix and match to your liking. Its all about having fun with the recipe and putting your own spin on it. For more great recipes vist The Grocery Cart Challenge Recipe Swap. We'll be trying these for sure! They look so good. Thank you Colleen, I do need some more oatmeal recipes. I have been making quick oatmeal mixes for dd she loves them. I've never attempted homemade granola bars. These look great. I need to check into that cookbook! These do indeed look very good. I have found Jane's book to be full of good advice as well! And way to go on stocking up your food storage. You never know when you might need it in a pinch! Wow, I had no idea National Granola Bar Day existed. Your recipe looks great! These look so good, I'll have to try making these! have a great weekend! I have never made granola bars before, but it sounds easy. I will definitely try these! Thank you! Look great! I've made homemade granola bars before but I'm always up for a new recipe! Droppin by from SITS to show some love! These look tasty! Might have to give it a try! Oh yummy. 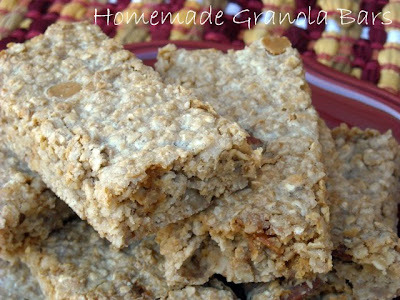 We eat alot of granola bars and this recipe is different from the one that I currently make. Something else to try! I love getting new ideas and your blog is one of my favorites. Thanks for your willingness to share. Those look great! We love granola at our house. Oh my! I made these tonight since DH is coming home from a conference tomorrow...used milk choc chips....smell awesome! I had some trouble cutting teh bars, but just decided to make squares instead! DD and I are making another batch with butterscotch chips tonight. Combining the end of our eat out of the pantry challenge with next months' try something new every week challenge. Thanks !